Salamanca is the most student-dominated city in Spain, which is located on the west of the country. 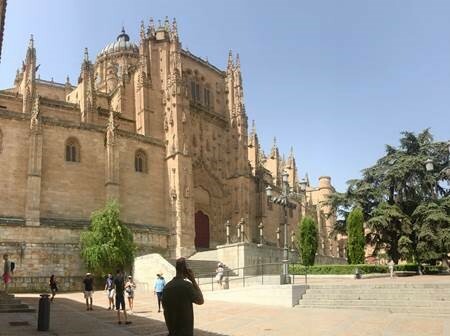 One of the reasons why so many youth decide to study in Salamanca is the fact that the University located there was founded in 1218 by King Alfonso IX; it was the fourth university in Europe. One of university’s main attractions is the Salamanca’s Frog (esp: Rana de Salamanca). It is one of thousands of ornaments on the facade of the university building. The frog is only a few centimeters long but there are some interesting legends related to it. One of them says that the one who finds the frog can be sure that he/she will graduate from the university and happily get married. According to other legends, the one who will first fall into the eye of Rana de Salamanca will also be the first to pass all the exams. And why a frog? Well, the theories about this differ. The most common explanation says that in ancient Egypt, the frog was a symbol of death. Over time, especially in the Middle Ages, the frog began to be identified with the sin of desire. Combining it with the skull was to give students a clear signal – those whose life will be promiscuous will suffer diseases and a fast death awaits them. In the old part of the city, we can find the main square of the city – the Plaza Mayor. Until the mid-nineteenth century, bullfights were held here. It is one of the largest squares in Spain (6,400 m2), and considered by many to be the most beautiful in Europe. It is surrounded by 88 arcades located on three-storey buildings. An unusual place is the Cathedral, which is combined from two into one. The first of these is the Old Cathedral (Catedral Vieja) from the 12th century. The second part of the complex is the Late Gothic New Cathedral (Catedral Nueva). Its construction began in the sixteenth century and at the time it was compared to the Cathedral. 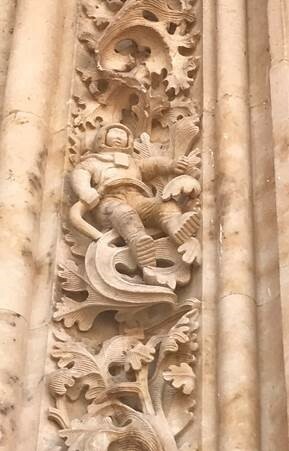 Later, the New Cathedral was enriched with Baroque elements but not only … On one of the portals (Puerta de Ramos), apart from the rich vegetative and animal ornaments we can also find clear references to modern times. The best example of this is a cosmonaut sculpture. How did it happen to be there? In 1992, when renovating the new cathedral, more contemporary elements were added to it in order to leave a mark of our times.